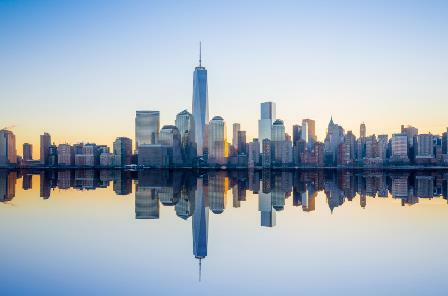 Blackstone Group LP jumped to the top spot in real estate acquisitions in New York last year, with purchases that encompassed Manhattan’s biggest apartment complex and stakes a group of office properties including the Starrett- Lehigh building on the Hudson River. Blackstone bought $9.6 billion of real estate in the New York metropolitan area in 2015, and sold $4.2 billion worth, the vast majority in Manhattan, according to preliminary figures from Real Capital Analytics Inc. The totals exclude the $1.95 billion sale of New York’s Waldorf Astoria hotel by Hilton Worldwide Holdings Inc., majority-owned by Blackstone at the time of the transaction. The New York-based firm was involved in 21 percent of all commercial-property transactions in Manhattan last year, Real Capital said. New York, the largest and priciest U.S. real estate market, has become a major target for Blackstone, the world’s biggest private equity real estate investor. In 2014, the firm wasn’t among the top 10 buyers of real estate in the city, according to Real Capital. Blackstone expects to maintain an active investment pace in the city this year, said Ken Caplan, chief investment officer of the company’s real estate unit. “Market volatility will certainly have an impact, but disruptions often present opportunities for those who have capital available to invest,” he said in an e-mail. Last year, Blackstone bought the Stuyvesant Town-Peter Cooper Village apartment complex for about $5.3 billion through a partnership with Canada’s Ivanhoe Cambridge, and acquired from RXR Realty a roughly 50 percent stake in office properties valued at a total of $4 billion. Other purchases included a minority stake in the Helmsley Building at 230 Park Ave., a property valued at $1.2 billion, and a shopping mall and garage in the Sky View Parc complex in New York’s Queens borough. Blackstone also acquired the JW Marriott Essex House hotel for $330 million as part of its takeover of Strategic Hotels & Resorts Inc.
Blackstone sold the office building at 1095 Avenue of the Americas for $2.2 billion, an office condominium at the former New York Times headquarters for $516 million, the leasehold on the London NYC hotel in midtown Manhattan for $382 million and the office building at 717 Fifth Ave., according to Real Capital and company data. The Avenue of the Americas deal was the biggest sale of a single U.S. office building since 2008.